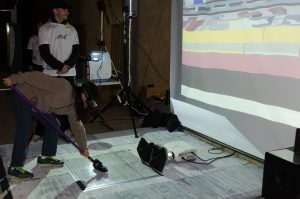 Curling Virtuoso is an interactive semi-curling based simulation, presented in the form of virtual reality experience. 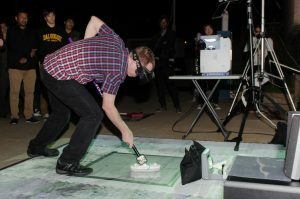 It is set up in the context of a public exhibit whereby the surrounding crowd can influence player’s decisions in the game. 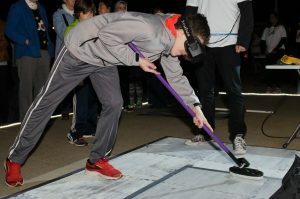 The purpose of this display is to explore the extent to which a participant can perform two simultaneous yet distinctive tasks, using a single interactive medium. 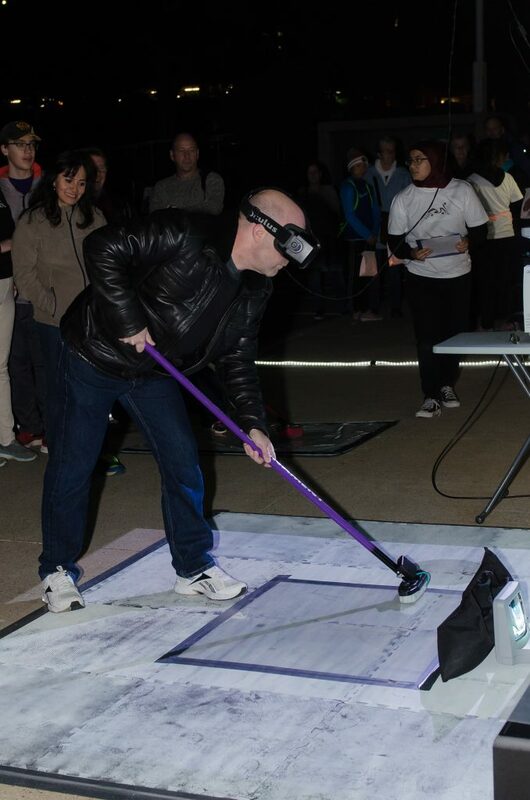 The medium, in this case, is an augmented curling broom, using which players balance the audio distortion provided to the game music while trying to accumulate higher scores. 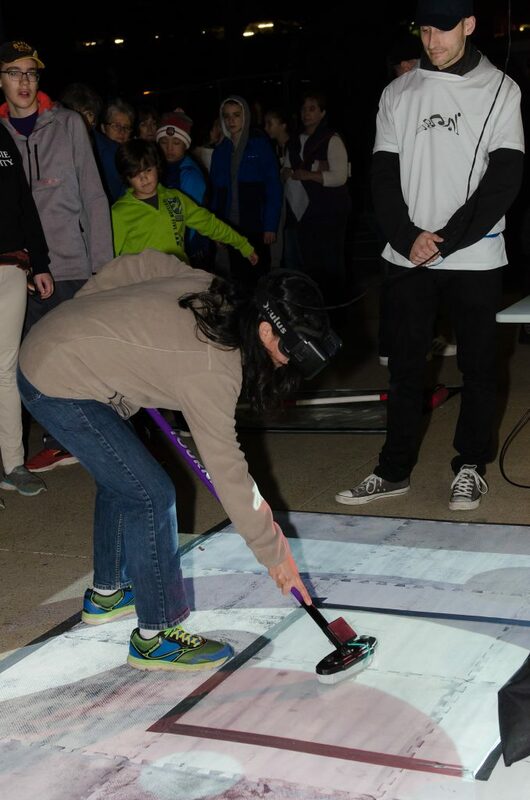 To start the game, participants wear a VR headset while holding the augmented brush to play four rounds of virtual curling. 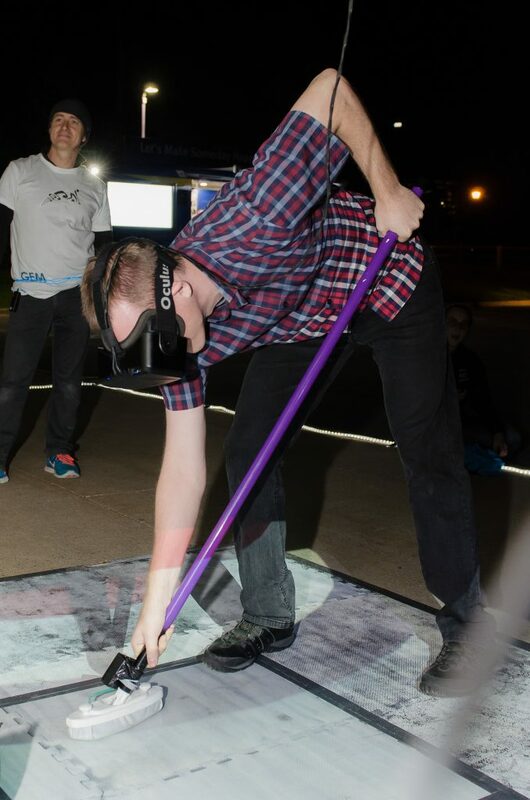 The broom’s motion in the real world translates back to the game, and the players can view their performance on a graph displayed on their headset’s screen. A black dot denotes the average pressure and frequency of the brush strokes that they are currently recording. The player’s screen also displays two colored zones (i.e., blue and yellow), which represents the targets the players are trying to achieve. Being inside the blue zone corrects the audio distortion resulting in quality music, whereas, being inside the yellow area rewards the player with a score. 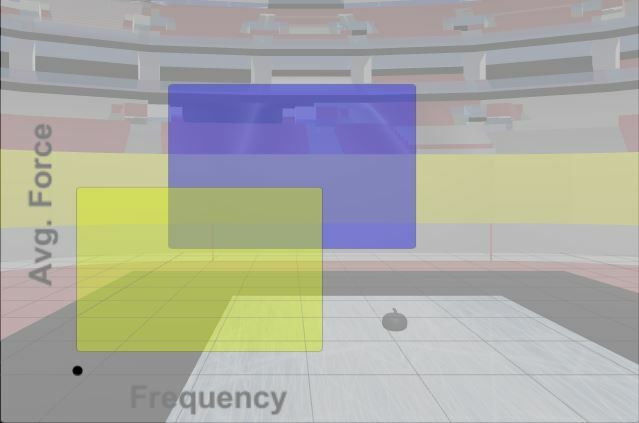 If the player exceeds or recedes the blue or yellow zone’s bounds, music deteriorates, and the scoring halts. The crowd can also view the player’s performance and may shout at random to either make the music sound better or motivate them to get a higher score. A research study is also conducted alongside the exhibit to record player interactions and analyze in-game behavior based on external stimuli from the crowd. After giving consent, the attendees have their game interactions, logged, and video-recorded, for further detailed analysis. Those completing a full game run are provided with sets of questionnaires, to answer questions based on their play-through and given a freebie for their participation. 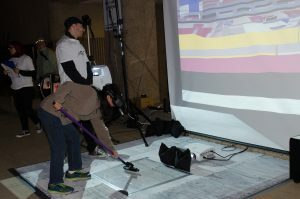 Curling Virtuoso debuted at the Nocturne Arts Festival outside the History of Natural Museum on 15 October 2017 and will be continually taken to curling related events to gather significant research data.